By hungry runner on June 9th, 2012 . Filed under: Cupcake Ideas, Decorating . 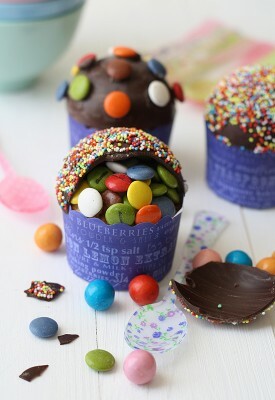 Have you seen these pinata cupcakes? I love cupcakes and pinatas so this is a very fun combination. A silicone mold is recommended and then you can use anything to fill the dome, candy, fruit, custard, or anything else you think of!